Lagunaria patersonia or Primrose Tree is an evergreen tree from tropical and subtropical regions of Australia. Known for its glossy green leaves and large pink flowers, the plant is grown in landscapes and gardens for summer flowering. Lagunaria patersonia grows as a tall and sturdy tree with the habits of forming symmetrical pyramidal shape. Though native to Australia and the Pacific Islands, Lagunaria patersonia is easily grown and propagated in most temperate climates of the world. 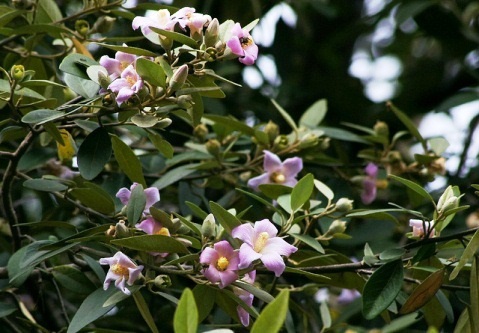 Because of rapid and sturdy growth of the tree, Lagunaria patersonia is often used for shade, as wind breaker in coastal landscapes, or for background screening garden landscapes. A mature tree can grow up to 15-25 meters and produce beautiful evergreen foliage with sprays of pink or mauve flowers. The shape and waxy texture of flowers of Lagunaria patersonia remind of Hibiscus. Lagunaria patersonia prefers full sun and protection from heavy frost. The tree is drought-tolerant and requires moderate watering in summer.